HORSE is a mixed-rotation game consisting of five games played in a limit format. Each game is played for eight hands and then the next game is dealt. HORSE is an acronym for the games in the rotation. The first two games (Hold’em and Omaha Hi/Lo) use betting use of typical hold’em games, while the final three games (Razz, Stud, Stud8b) are all seven-card stud variations. HORSE is generally played with a maximum of 8 players due to the 7-card stud variations. In the event ever player remains in the pot in one of these games, the 7th and final card is dealt face up as a community card. The first game in the rotation is basic fixed-limit Texas Hold’em. The order of play is determined by the dealer/dealer button and the Small and Big Blinds. In games with a fixed dealer, the dealer button is passed to the left after each hand to determine where the deal should start. The cards are dealt one at a time starting with the player to the immediate left of the dealer. 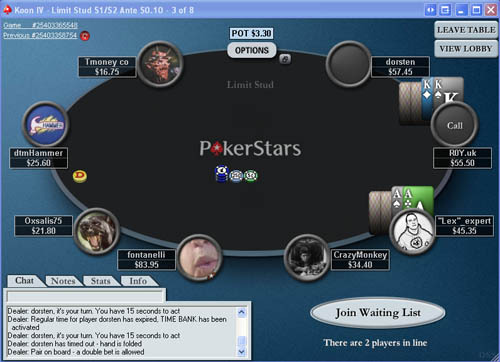 The Small Blind is the player to the left of the dealer and the Big Blind is the player two to the left. These blinds or “forced bets” are put in place to increase action. In fixed-limit the first two betting rounds work in increments of the Big Blind, and in the final two rounds the betting rounds work in increments of 2X the Big Blind (also known as a Big Bet). In each betting round the maximum number of bets that each player can make is four. When the fourth bet is placed the pot is deemed to be “capped” meaning players can no longer raise during this round. Therefore, the maximum amount of money a player can lose in any given pot is 24 Big Blinds or 12 Big Bets. Each player receives two cards, face down, known as “hole cards”. The first person to act is the player to the left of the Big Blind, or sometimes known as under-the-gun. He/she can fold/call/raise. The action then moves to the left with each player having the options to fold/call/raise as well. Once the first round of betting is over, the dealer will discard a card, face down, off the top of the deck, and then place three cards, face-up, in the middle of the table. This is known as “the flop”. These cards are known as community (or shared) cards; every player remaining in the pot will use these cards to improve their hand. The first person to act after the flop is dealt is not the player to the left of the Big Blind, rather it is the first player still involved in the pot to the left of the dealer (or dealer button). The first player to act will either check or bet, and players afterwards will base their action off of this. If the player first to acts bets, then players will have the options to fold, call, or raise this bet. If the player first to act checks the next player can check or bet. 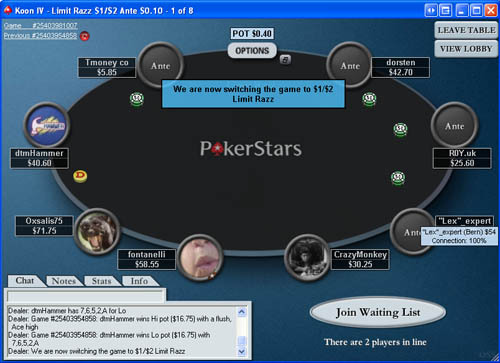 The action is complete when four bets have been placed, if all players check, or if the player to the right of the last aggressor either calls or folds, instead of re-raising. The dealer will then discard another card, face down, and turn another card face up, known as the “turn card”. The same rules apply for this round, except that the amount that is to be bet has now doubled, to 2X the Big Blind. High-Card– Having five cards of different ranks. 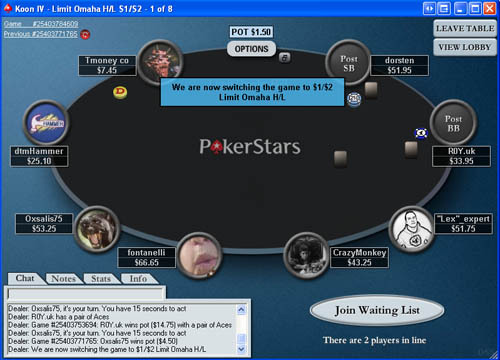 Omaha is a game which uses Hold’em betting rules but each player is dealt four cards. Out of these four cards a player MUST use TWO cards and ONLY two cards. As in Hold’em there are five community cards; however, unlike in Hold’em, each player can only use three of the five community cards to improve their hand. What does Player A have? If you said a full house, that is wrong. If you said trip 5’s with an A-K kicker, you are correct. You cannot play the ace on the board (unless you want to make 2pr, which is a worse hand than 3-of-a-kind) and you must use two cards in your hand. Therefore, a hand such a: 6s 6d Jh Kc beats your hand because they would have a full house, 6s over 5s. Another typical board-reading error deals with four-flushes. In Hold’em you can make a flush by using either one or two cards in your hand; however, in Omaha there must be three of the suit on the board and two of the same suit in your hand to make a flush. Omaha uses the same betting rules as Hold’em, and the same positions. 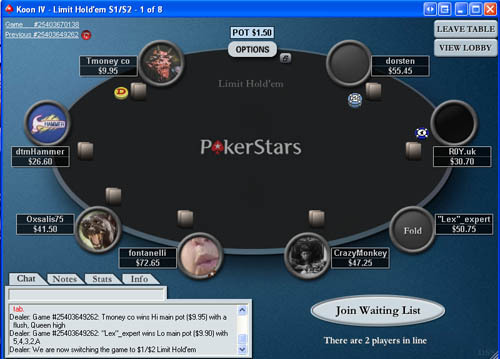 There are two blinds (small and big) and a dealer button to determine where the action starts each round. Players can bet/raise up to 4bets on each street, and the bet doubles on the turn/river. HORSE, however, does not use Omaha; it uses Omaha Hi/Lo (sometimes referred to as Omaha8b, or Omaha-8-or-better). Omaha Hi/Lo is a split-pot game, half of the final pot is awarded to the highest 5-card poker hand and the other half is awarded to the worst poker hand which must consist of five cards 8 or lower. The Ace can act as both a high and low card, and is the nut low card. Straights can count as both low and high hands, as can flushes. Therefore, A2345 is the nut low hand, and could also win the high-half of the pot as well. The same could be said for a hand such as As2s3s4s7s which makes an ace-high flush and a 7-high low. The strength of the low hand starts at the highest card, for example, A2347 loses to 23456. Let’s look as some more examples to clarify, remember, you must use two cards from your four-card hand and three of the community cards. In Hi/Lo you can use different cards for the high/low hands from your hand and on the board. In this example player A makes both a high and low hand using different cards in his hand. He makes the nut low-hand possible A2458 and he makes the nut high-hand as well, AcKcJc4c5c. As you can see, he used three cards from his hand; however, he only used two in the low hand and two in the high hand. The board comes 2d 4h 7s making Player A the nut low hand on the flop. However, if the turn comes an Ace or a 3 he would no longer have the nut-low hand, this is called being counterfeited. If the turn were to come a 3, any player holding A5xx, 56xx, A6xx would actually make a better low, as they would have either a 6 or 5 low, and player A would still be left holding a 7-low. This is an important topic and one which is constantly and unnecessarily overlooked. In the event two players make the same high or low hand and there is split pot each of those players receive ¼ of the pot, and the other player would still receive half the pot for winning one side outright. This is often referred to as getting “quartered”. If a player were to win both the high and low sides they are said to have “scooped” the pot. Razz is the third game in the HORSE rotation and is a stud variant. The object of the game of razz is to make the worst five-card poker hand possible. In Razz the Ace is low, and the nut hand is the wheel, A-2-3-4-5. Straights and flushes do not count against a player in Razz. Razz is played with a maximum of eight players, in the event that every player stays in to see the final card it is dealt face-up in the middle of the table as a community card. Stud games have a different betting structure than Hold’em games and some of the stud games differ from each other. Stud games do not have blinds; they have antes, usually a fairly small % of the betting levels. To start all Stud games each player receives two cards face-down and another card face-up. The two down-cards are knows as “hole-cards” and the face-up card is known as the “door card” or “up card”. Players will eventually have four up-cards and three hole-cards, the seventh card being dealt face down. After each card is dealt there is a betting round. In Razz the player with the highest card (in Razz the high card is a King) showing must start the action by either using the “bring-in bet” or raising. If more than one player shares the high card, the player closest to the dealer is forced to bring-in. This bet is generally much smaller. For instance, in a game with a $5/$10 structure, the bring-in is $2 and a normal ante would be $.50. The bring-in can opt to raise, which would be to $5 in the $5/$10 game. Once the first player acts all other players can either call, fold, or raise. In most games the largest amount of bets that can be put in on a single betting round is four. The small bet is used in the first three betting rounds (i.e. $5 in the $5/10 game) and the Big Bet is used in the last two rounds. The players with the lowest hand showing start each betting round and play moves to their left. If every player has a pair showing the lowest pair starts the betting. In the end the worst poker hand wins, and a hands’ strength is determined by its highest card. For example, T-7-4-3-A would losing to 8-7-6-5-4. If neither player makes five non-pairing cards the worst two-pair or three-of-a-kind hand wins the pot. The fourth game in the HORSE rotation is Seven-Card Stud. This is a high-hand only game, and the pot is only split if players hold identical hands. 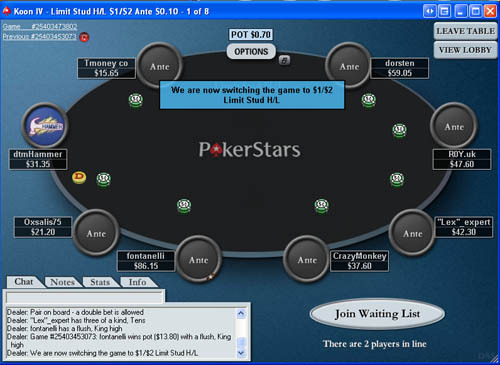 Stud is played with a maximum of eight players, in the event that every player stays in to see the final card it is dealt face-up in the middle of the table as a community card. The Ace can be either high or low; it can make both the low and high ends of straights, A-2-3-4-5 or T-J-Q-K-A and is the high card when making a flush. Just like in Razz the game uses antes, not blinds. All players “ante-up” and are dealt two cards face-down and one card face-up. In every betting round the player with the best exposed hand starts the betting and the action moves to their left. After the first three cards are dealt the player with the lowest card showing must either raise or bring-in. When players have three, four, or five cards the bet used is the Small Bet. On the final two streets (sixth and seventh) the bet doubles to what is termed the “Big Bet”. On each round the maximum number of raises allowed is three meaning four bets can go in from each player. If two players both end up with a flush the highest card is the determining factor to who wins. If they both have the same high card then the next highest card wins. For example, player A has KcJc7c4c2c and Player B has KsJs6s5s4s Player A would win. There is one special rule to Seven-Card Stud that differs from Razz, on third street (where each player has two up-cards) if any player has a pair showing he/she is allowed to employ a “double bet”, meaning in a $5/$10 game instead of using the normal $5 bet on fourth street the player with a pair showing can either check, bet $5 or bet $10. The fifth and final game in the HORSE rotation is Seven-Card Stud Hi/Lo, or sometimes referred to as Seven-Card Stud 8b (eight-or-better). This is a split pot game in which half of the pot is awarded to the best five-card poker hand and the other half is awarded to the best five-card low hand, which is five cards 8 or lower. In the event there is no eligible low-hand the high card wins the entire pot. The same betting rules apply in this game as they do in Seven-Card Stud. The bring-in remains with the player with the lowest card showing and the first person to act on subsequent rounds is the player with the best high-hand showing. As in other Stud variants there is the ante, the bring-in, and a small and big bet. The first three rounds use the Small Bet while the final two rounds use the Big Bet. Each betting round is capped after three raises, meaning only four bets can go in from each player on any given betting round. Just as in Stud Hi if a player were to have a pair showing on third street he/she has the option to check, bet $5, or bet $10. In the event that two players have identical high or low hands they will split their half of the pot, this is generally referred to as being quartered. For instance if Player A has two pair, Players B and C both have a low of 8-5-4-3-2 Player A would win half of the pot and Players B and C would each win one-fourth, or a quarter of the pot. To determine the best low hand you must start with the highest card and work down. Therefore 7-6-5-4-2 would beat 8-5-4-3-A. The Ace can be both high and low in this game and straights/flushes can count for both the low and the high. Players do not have to use the same five cards for both high and low hands either. For example, a player holding A-2-3-6-7-A-A would have three-of-a-kind for the high hand and a 7-6-3-2-A for the low. This player would be in great shape to win the entire pot, often referred to as “scooping”. A final note, just as in Stud, there is a maximum of 8 players allowed at each table and if every player stays in for the final card it will be dealt face-up in the middle of the table. You can find HORSE games offered at PokerStars!